Which site has been chosen? 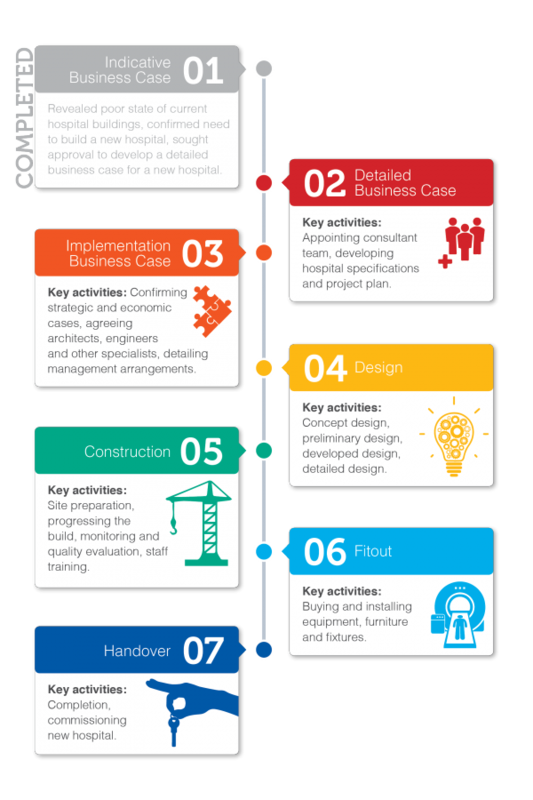 * Information taken from the new website for the Dunedin Hospital rebuild. When will construction start and when will it be complete? On the site for the hospital redevelopment the project organisers said the Wilson’s site gave it a large piece of land close to both the university and the bits of the existing hospital that we will retain, such as the oncology precinct. The Wilson’s site alone would not have been big enough and buying both it and the Cadbury site provided greater flexibility about where it built the various parts of hospital complex and for further development. How will the site be used? Two indicative plans have been released, one showing a configuration which makes more use of the Wilson's block and the other of the Cadbury block. What is happening to Cadbury World? Modelez International announced today it plans to close Cadbury World. Mondelez owns the Cadbury site. Mondelez recently closed their factory and had already approached the Ministry of Health to see if there was interest in it as a site for Dunedin Hospital. Negotiations were ongoing with Mondelez. The site next door which contains the Wilson’s carpark had eight owners and it could take a bit longer to get through all the paperwork to purchase these properties. The cost was commercially sensitive at this stage but the price of the land was not a significant part of the billion-dollar-plus budget. The purchase would be funded by the Crown. Before the election, the Government dropped the previous government’s plans for a public-private partnership. It is up to the landowners to let their tenants know about the plan to build a new Dunedin Hospital on this site. However there will be little change for the existing businesses for some time yet. There was still a great deal to do before construction began. Are there any historic buildings or facades to consider on the site? What will be done about them? There were some older facades on the site which were protected under the District Plan. "Should we wish to demolish then we will go through the proper process. "We have completed a shading study to confirm that new buildings need not unduly shadow the historic precinct if there is good design." The design teams would look at the possibility of retaining the Cadbury Dairy Building façade – but were a long way off any detailed plans for the hospital. Now that the site is chosen, attention can focus on completing a detailed business Case to the satisfaction of the Government. That work is scheduled for completion mid-year. An Indicative Business Case has already been approved. At the same time, it was starting the detailed planning and design process. Building a tertiary hospital the size of Dunedin was very complex. The planning and design process was a "perhaps surprisingly large part of the overall budget - around 20%"
Expressions of Interest for the approximately 150 architects, engineers and other professionals needed to design the hospital had already gone out. The next phase, of receiving tenders and deciding on the design teams, would occur as soon as the Detailed Business Case is approved. We plan progressively to let the contracts in the second half of this year. It is likely most design contracts would be let to offshore companies, or to joint ventures of NZ and offshore companies, rather than NZ companies alone. "This is the largest capital project in the history of the NZ health system. As with other hospital projects it is beyond the resources and capacity of just NZ companies." The only reason given here for declining the Wakari site is a political one. It is stated that the people of Dunedin wanted a central city site close to the University of Otago medical school. When the Dunedin City Council (elected reps) launched a campaign promoting a central city site close to the university, the main grounds used was economic decelopment of the city along with its teaching hospital. There was also an argument made about access - the Wakari site was a little further away, would require bus transport and may be hard to access during snow and ice. However, the people of Dunedin were never directly polled on site selection. It seems a very bad idea to me to make a strategic and logistic decision on the basis of perceived popular opinion. I doubt any generals ever won a war like that. I can forsee terrible disruption of the central city ( along with the IMO ill-conceived central city cycleways), disruption which will continue for many years. There will be no economic benefit to Dunedin from attempting this massive central city hospital re-build. Pity decision-makers are not familar with general systems theory where complex systems ALWAYS stir up Murphy’s law.